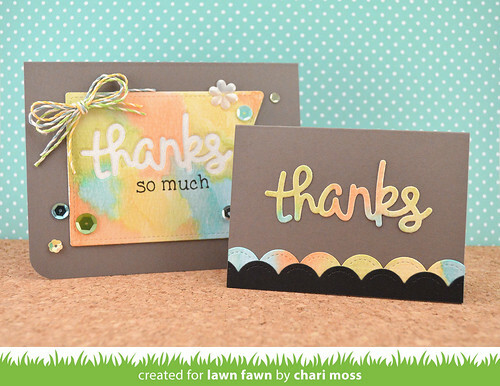 It's the final day of Lawn Fawn's May Inspiration week. Today we are featuring the new die Scripty Thanks as well as an addition to the Let's Polka line, Freshly Cut Grass Line Dance! The stripe family was missing it's green before but not anymore! I have a couple projects to share, the first features the new paper along with others from the Let's Polka collection. For the background of this card I cut strips of the green and yellow stripe paper and bumped them up against each other in opposite directions to create a sort of chevron pattern. I cut the frame and blue background for the image from papers from the petite paper pack so that there would variations in the scale of the patterns. 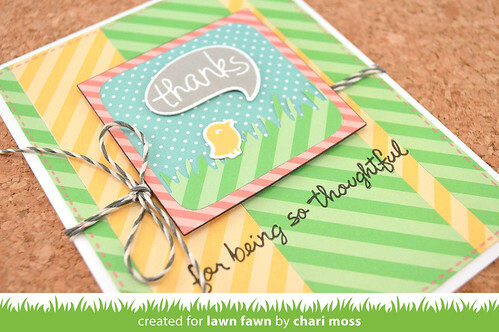 The little bird and speech bubble are from the new Chit Chat set and I cut the grass using the Grassy Border Die. I finished my sentiment by using a portion of one of the sentiments from Many Thanks and finished it off with some Cloudy Lawn Trimmings Twine. When working on my Scripty Thanks project I managed to create two cards by using both the positive cut as well as the negative. I started by wanting to create a card using the negative space of the die. So I cut a piece of watercolor with the Stitched Party banner die and used my distress inks and water to add color to it. Once dry I die cut my sentiment. I used a piece of white card stock and double sided adhesive paper to to create the background you see through the die cut. I used the adhesive paper so that I could cover the opening with microfine glitter so it would really shine. I used Smitty's ABCs to finish off my sentiment and mounted the banner to a grey card base. I used my sequins and twine to cover up the holes cut by the banner die. 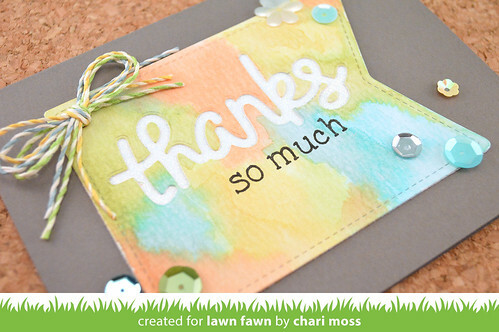 I used the die cut left over from my banner to create another little Thanks card. I cut another piece of watercolor paper with the large Stitched Scallop border die and watercolored it with distress inks to match the sentiment. Stop by the Lawn Fawn Blog to see more projects with the new Freshly Cut Grass Line Dance paper and the Scripty Thanks die. Thanks for stopping by today! 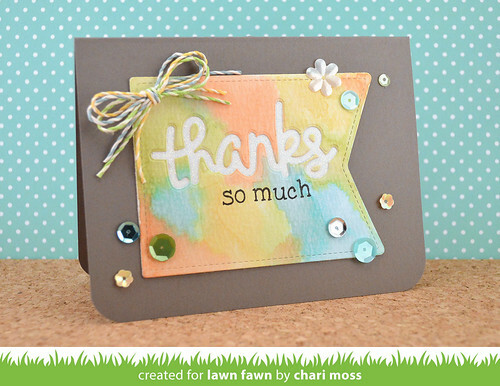 Love how you used the positive and negative products of the die cut. The water color combinations are wonderful! Love your cards! That line of papers is gorgeous! Chari, your cards are so cool!!!! I just love everything you do. 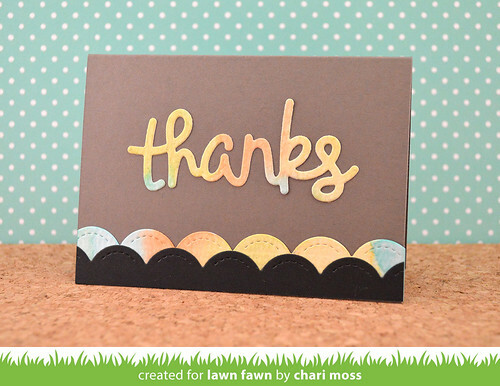 I love Lawn Fawn and all what you do with their products.